Like Lady Diana and Princess Grace of Monaco, Talitha’s mystique may be amplified because she died so young, at age 30. She is frozen in time with flawless skin and lush hair. 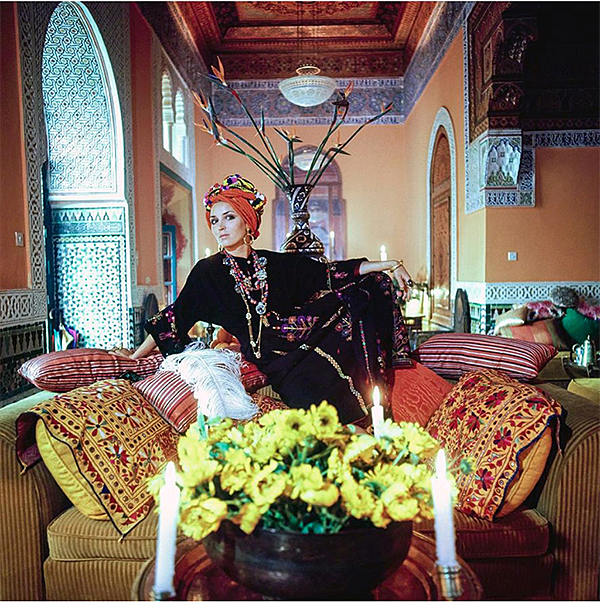 Diana Vreeland said that Talitha was THE style icon during her Moroccan caftan and Persian jewelry years. Talitha to this day is still celebrated as a style muse by fashion designers. Not a ton of photos of Talitha exist, but I captured all photos I could find on a Pinterest board of Talitha Getty style. 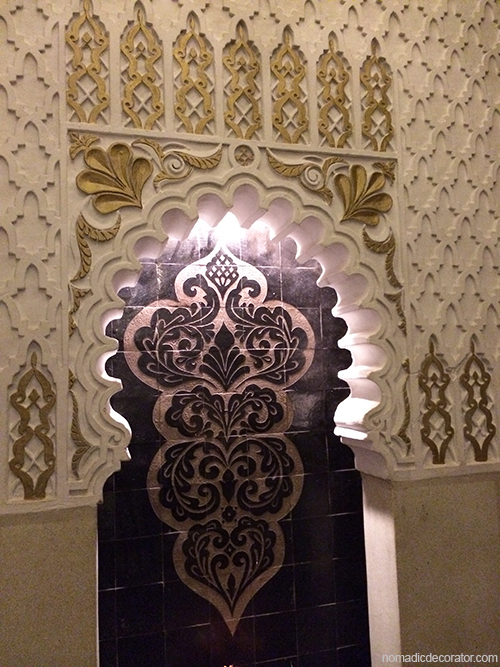 There was someone else who revolved in the Getty’s beautifully-designed orbit in Marrakech. 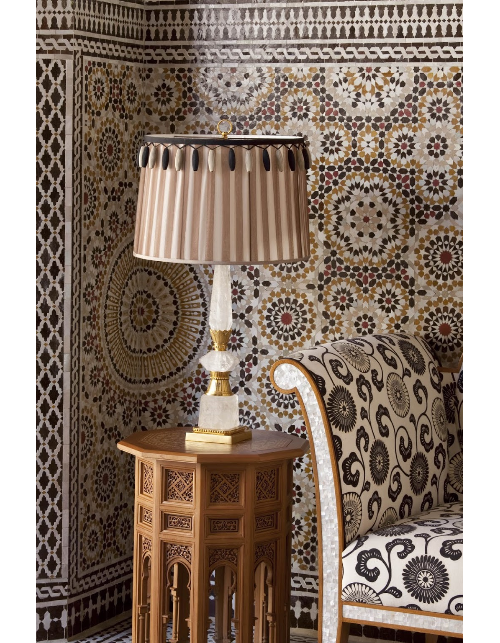 Someone who had a bigger, more enduring influence on Moroccan style. I bet you haven’t heard of him. 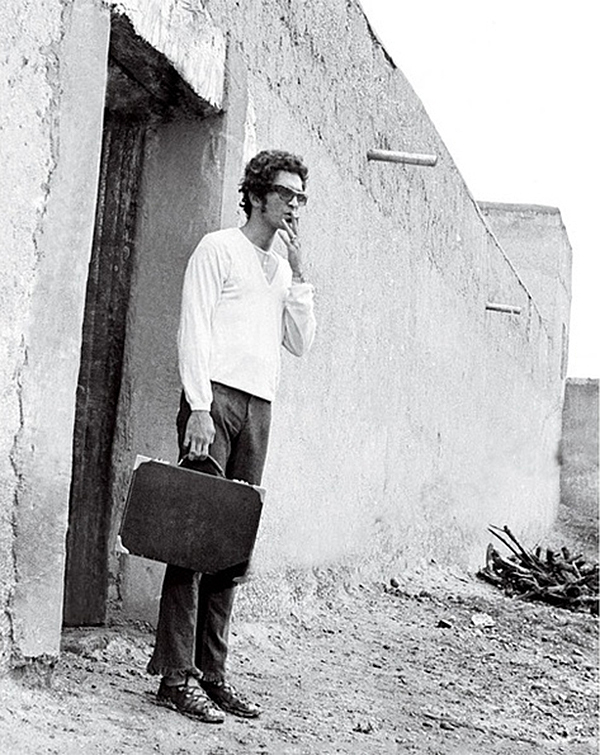 He deserved greater public recognition because hallmarks of Marrakech style today are traced to him. 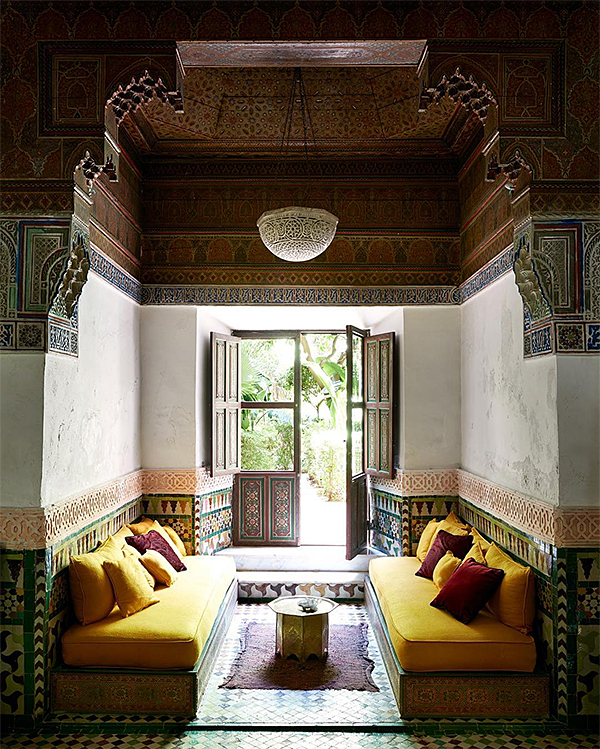 He revived dying arts and filled opulent homes with beautiful tiles and tadelakt walls, ceilings, fireplaces, floors and furniture. The funny thing is, he wasn’t Moroccan. He was from Memphis. His name was Bill Willis. 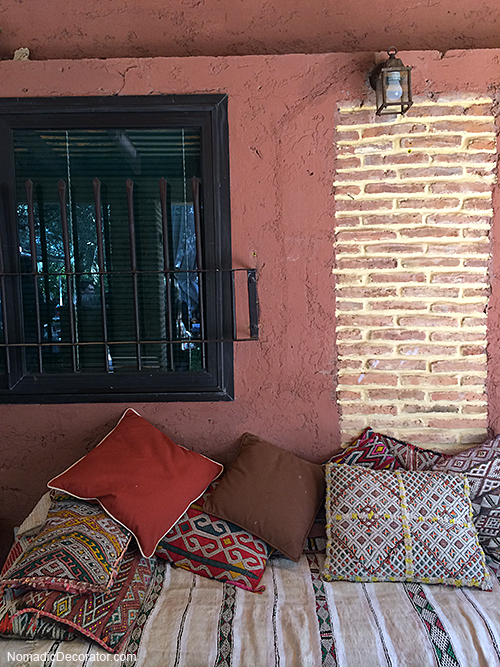 Have you admired the tadelakt walls in Marrakech homes? That is because of Bill Willis. Before Bill, tadelakt was used in the hammams because it’s waterproof. It was not used throughout houses. 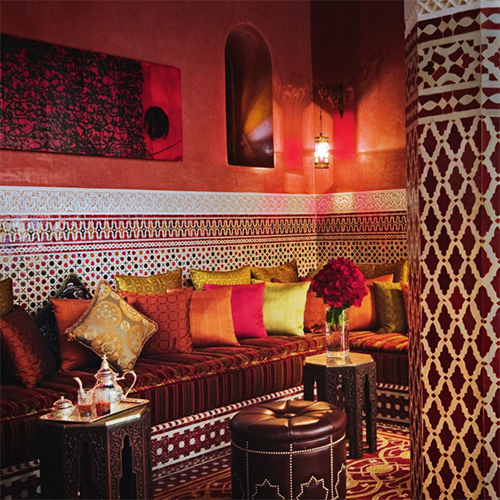 But this polished plaster surface is now the quintessential Marrakech wall. 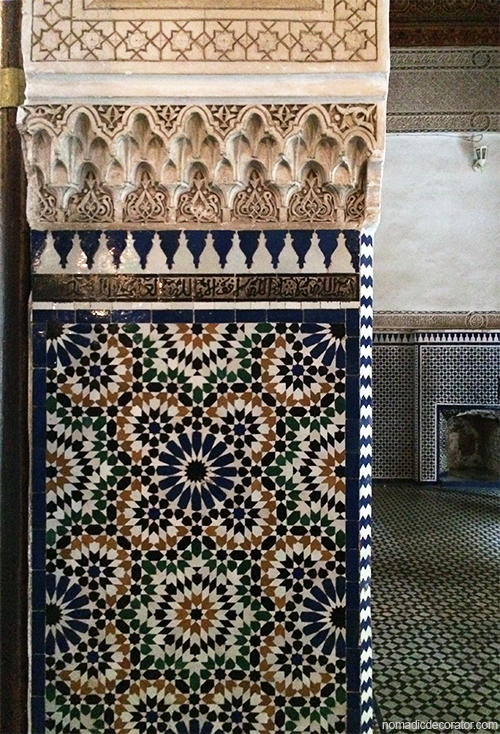 Have you seen crazy, colorful combinations of patterned tiles on fireplaces in Marrakech? That is because of Bill Willis. 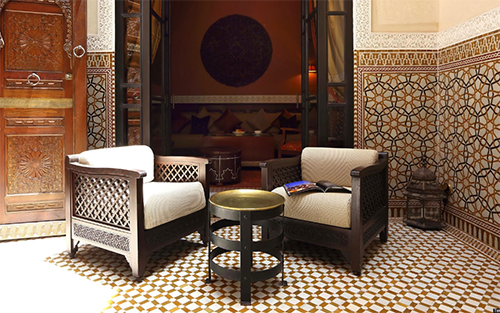 He restored and revived zellij mosaic tilework and brought it into the 20th century with a “modern ideas with Moroccan materials” mentality. 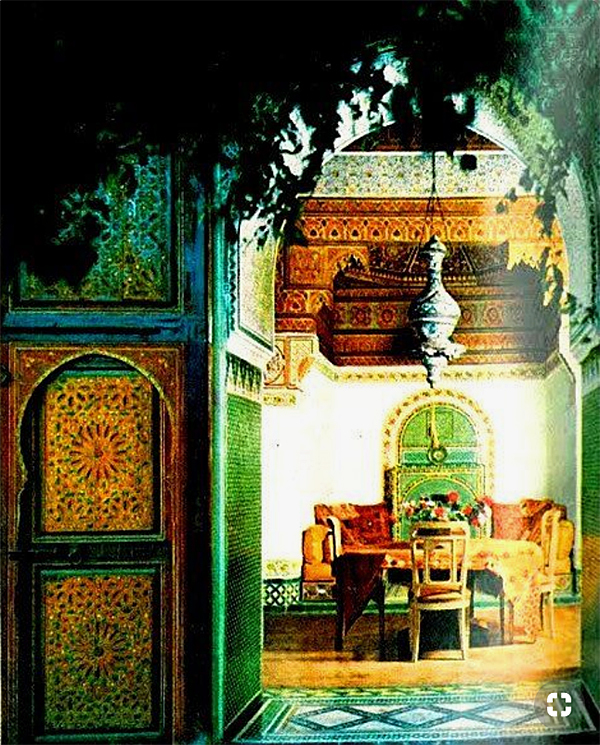 This was in the 1960s, long before Marrakech was the tourist attraction that it is today. I imagine it was beyond rough for travelers used to luxury. But from this ruin, within only a few years, Bill Willis and the Gettys created breathtaking beauty. 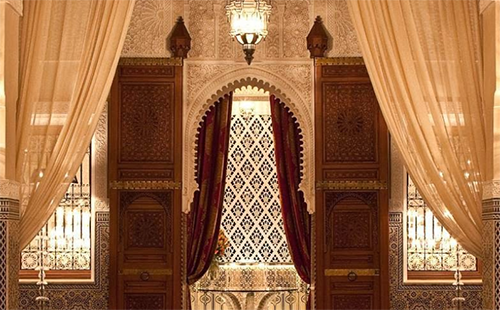 They created a place with a name prepared for debauchery: Palais du Zahir (also known as Palais de la Zahia) — the Pleasure Palace. Video credit from Jeremy Riggall on Vimeo. 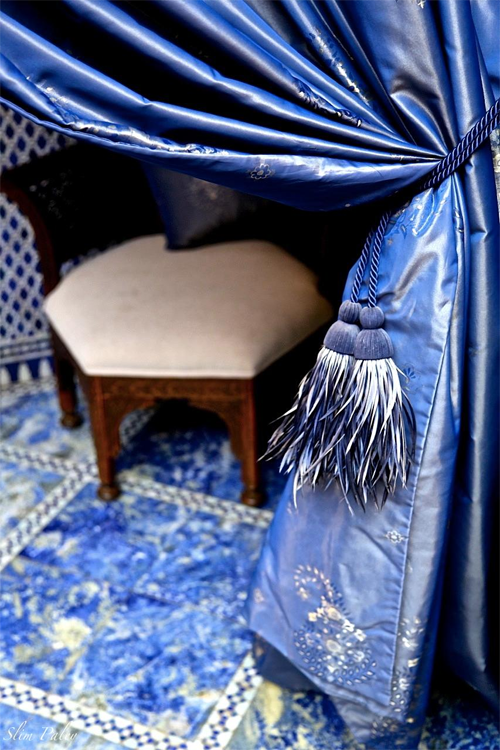 I hit replay and screen-captured those Palais du Zahir rooms like a crazy obsessed woman! If you ever want the original Vogue issue, I found mine on eBay and see them there occasionally. I could probably be persuaded to part with mine! I notice, it has a different brick floor now. Unless this is a different area of the roof than what we see in the 1970 Vogue magazine. 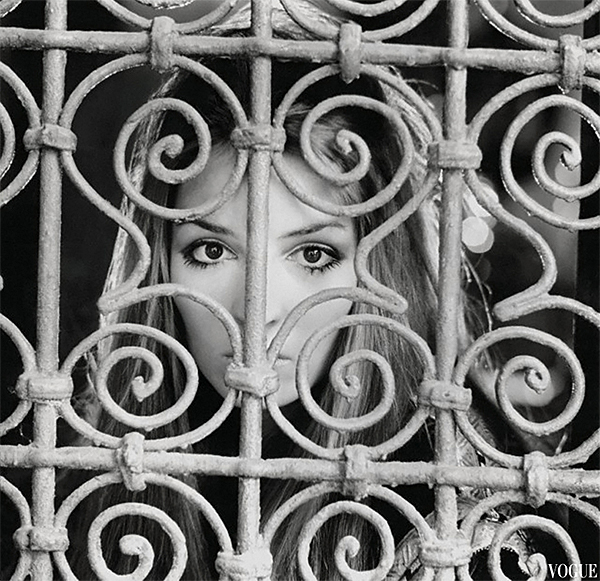 Don’t those look like the same iron grilles that Talitha is peeking through in the photo above? 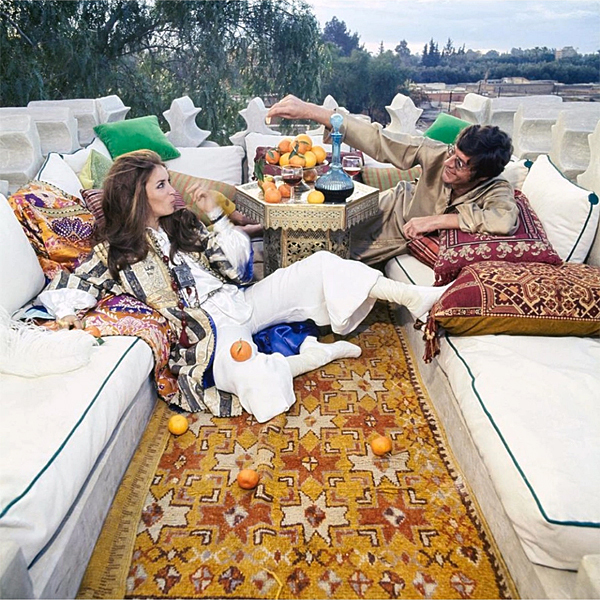 No longer a place of drug-fueled hedonistic parties (none other than Keith Richards said that Talitha Getty had access to the best opium), now the palace is a discreet address where feuding world leaders gather in privacy and try to broker peace, and for an intellectual writer to think and write in solitude. Some palace walls have stood since the 1500s or the 1700s, depending on who you ask. Oh, what the walls must have seen over the centuries! 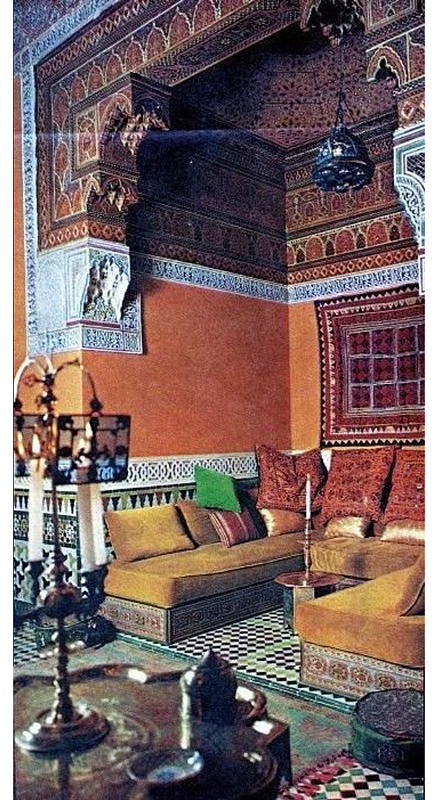 I share everything I found about the Getty palace on a Palais du Zahir Pinterest board. 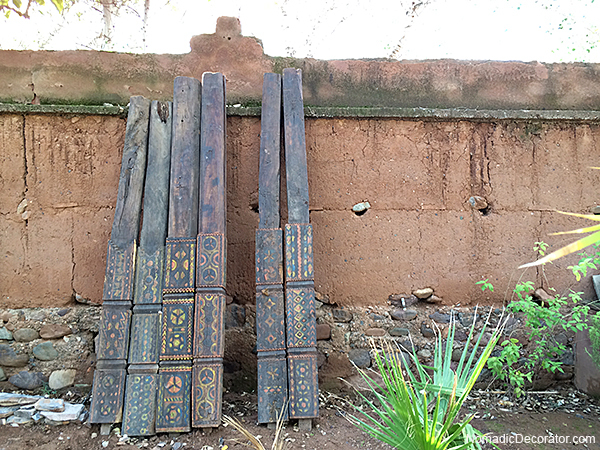 Bill Willis’ contribution to Marrakech and Moroccan style is now unnoticed and unappreciated. Some of that appears to be his own fault. Though he had a reputation as an exacting and demanding designer, he slept until late afternoon and his neighbors thought he was a vampire. And he was intoxicated during most waking hours. 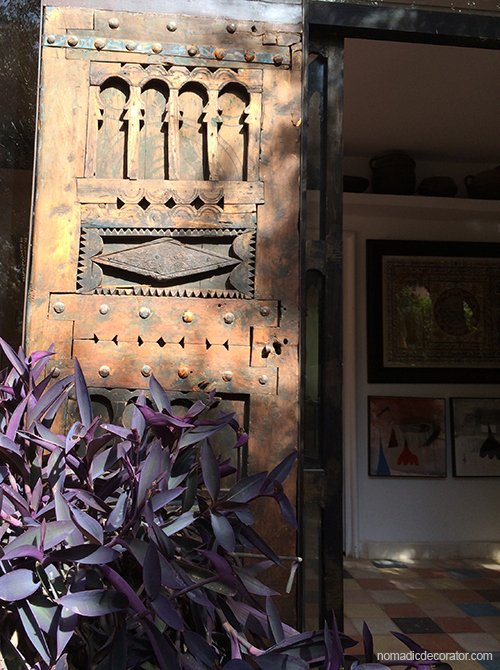 Despite that, his genius still prevailed in glorious Marrakech architecture. 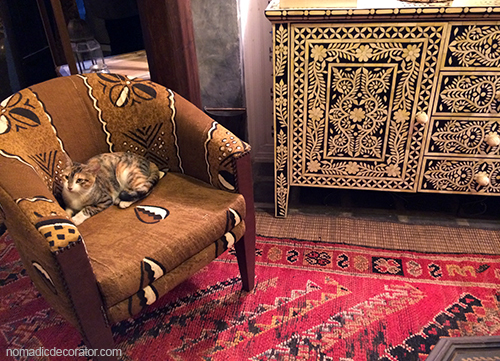 Efforts might be underway to raise his profile, possibly through the riad that was once his home in Marrakech. How often does a designer influence the style of a whole city? And in a way that stimulates a whole travel and tourism industry, boosting an entire economy? At every corner you turn in Marrakech, there are photo ops. 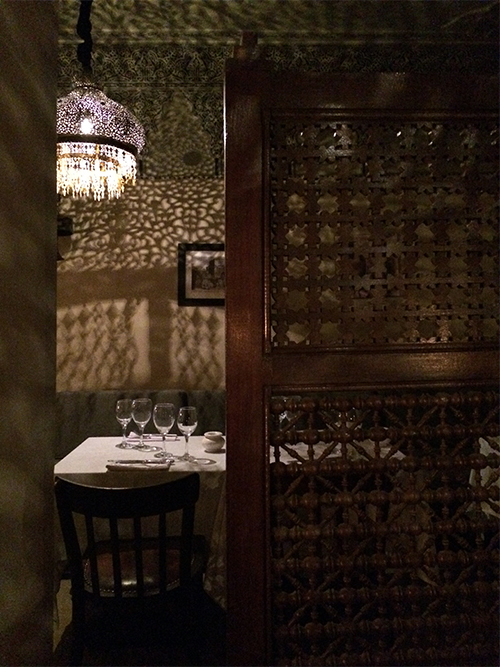 Old walls, old doors, what’s below your feet and above your head, somehow it’s all very special. 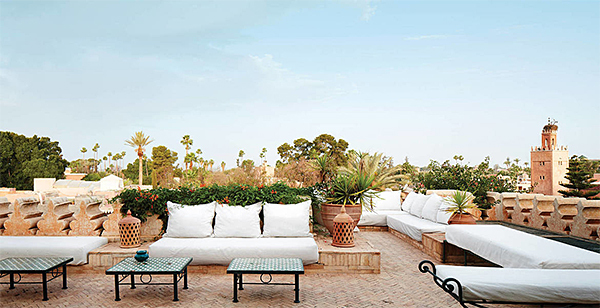 Marrakech inspires our imaginations. Captures us and makes us want to return. Would Bill Willis have ever imagined that happening? 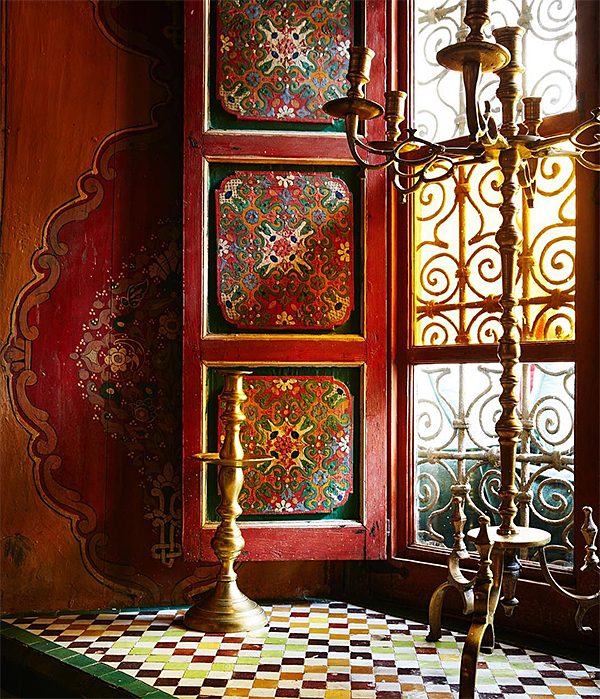 Beyond many nondescript doors and plain medina walls there is glittering opulence, pierced metal lanterns casting dancing shadows, woven textiles exploding with color against fantastical patterned walls. 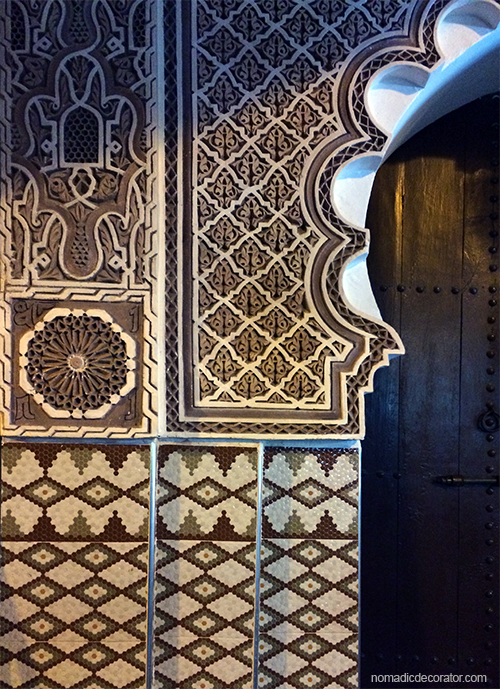 Run your hands along the cool smooth tadelakt walls. Bill Willis made that possible. My workdays are full of logic, science, and project management. The bit of art during the day is about the communications we create to influence people. So by nightfall, I’m looking for balance in visual arts. 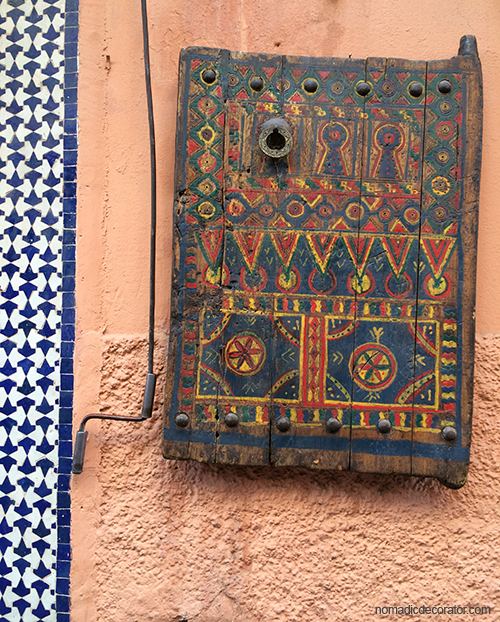 One reason I went to Marrakech in 2014 was to get surrounded by beauty, to get inspired to create visual things I hadn’t thought of doing before. 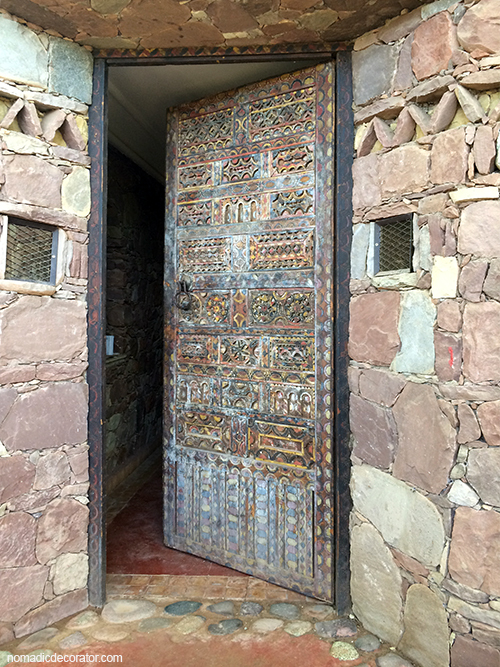 An inspiring place was the Al Maqam artist’s colony in Tahanaout, about a half hour drive outside Marrakech on the way to the Atlas Mountains. A New York Times article tells you more about the place. 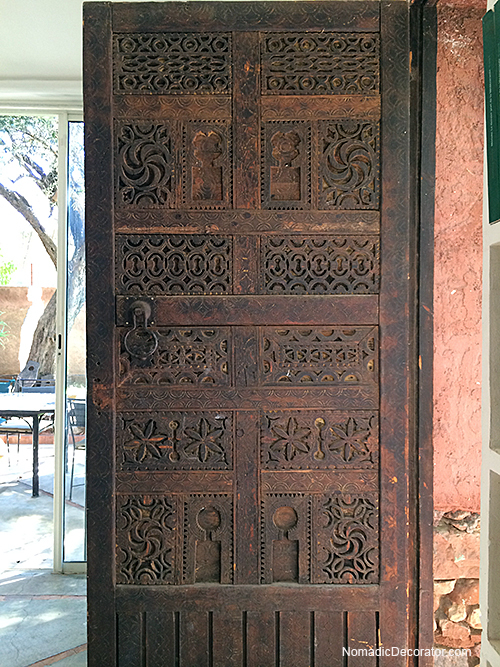 A lot of doors and windows caught my eye there, and the NYT article mentions that the founder of the colony bought old doors and windows at Morocco flea markets and gradually built the compound room by room. 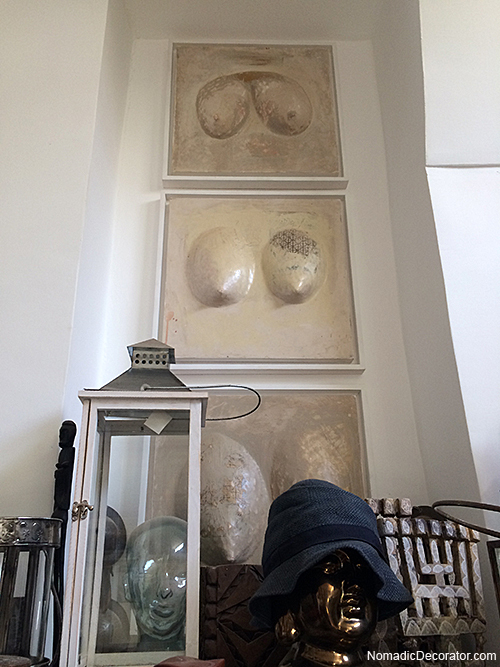 Maybe that’s how we’re going to decorate the India pied-à-terre, bit by bit from pieces from here and there. 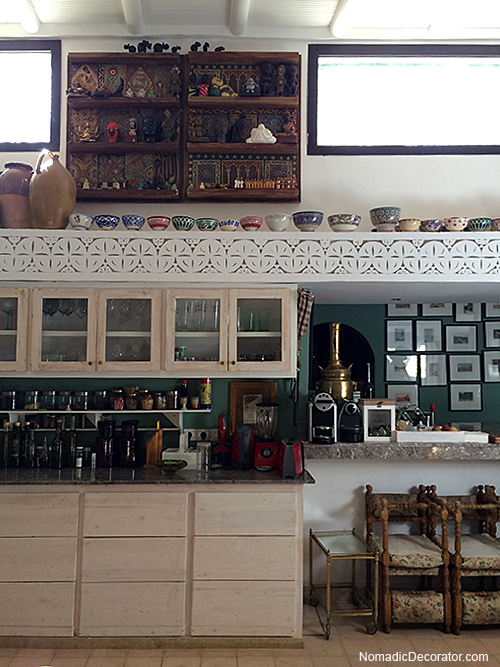 Here’s more photos from the artist’s colony, decorated as you might expect — creative, eclectic, lots of interesting proportions, playing with balance, and curious collections of objects. I spent too much time there looking at the place through my iPhone, I think now, but at least I captured these. Do you see stencil patterns there? I do! 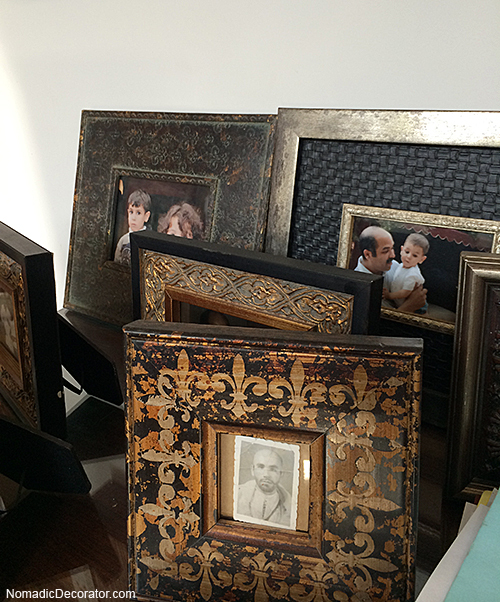 Frames like these don’t have to cost a lot. I’ve found frames very similar to these at Target and HomeGoods. They were in a corner of a dining room. Told you. Eclectic. Creative. There was no time spent on creating a “just enough carelessness” look. (I know how photo shoots and styling can be!) That’s just how the pillows were. And the always-present wine glasses. Of which I had too much on an empty stomach before lunch and photos got fuzzy after awhile. I have a pile of wood posts leaning against our house in the backyard right now, and I assure you, it definitely doesn’t have any artistic effect. So I say appreciate this — it’s not easy to make a pile of posts look attractive! I’d like to create this effect with some old things just lying around my living room. But in my hands, they might look like things that I was too lazy to move down to the basement, so there they sit. All these pieces added up to an inspiring creative space. 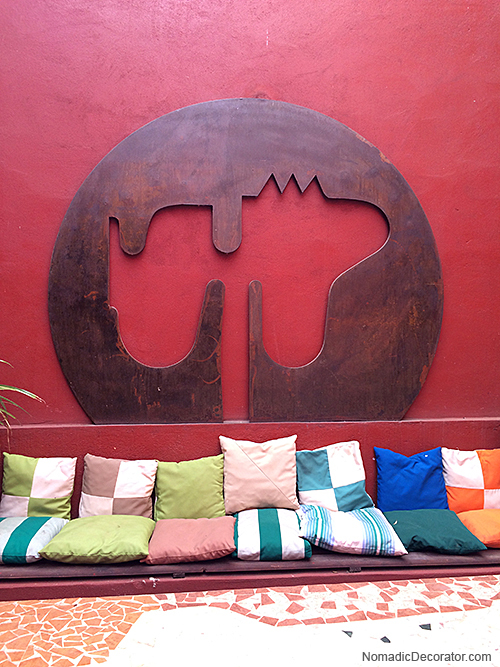 It’s a big place – we got a tour through many indoor and outdoor rooms and this is just a glimpse. 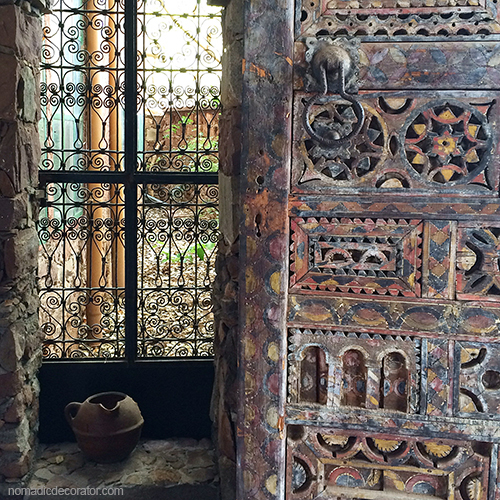 What stands out to me are the contrasts, the textures, the collections, the colors. You can take bits and pieces of ideas and weave them into your own space. That first night I bravely forged ahead into the souks by myself and quickly got lost. 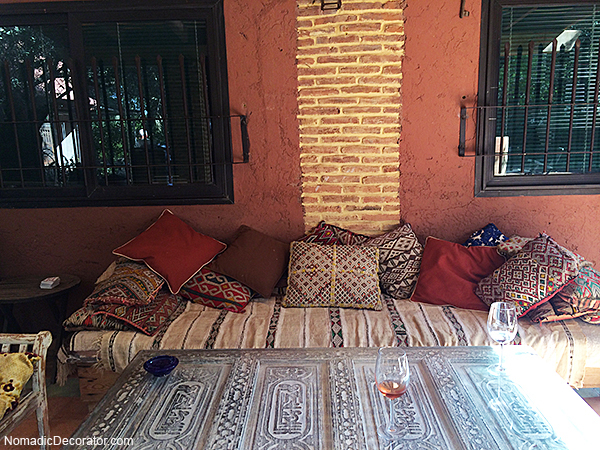 After walking what felt like 20 miles, I eventually found our riad again. I wasn’t sure where to go, but I knew when I was going in the wrong direction. Finally after asking people and a guy on a bike watching out for me (and never asking me for any money), I found the Jemaa el Fna and the familiar lane to our riad. Whew! 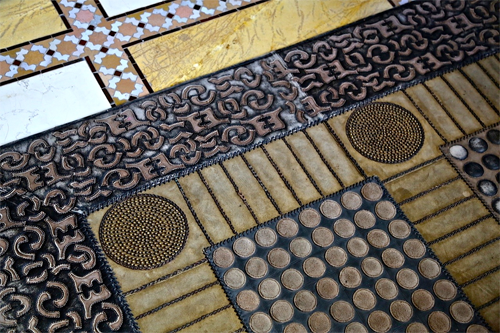 After that I made sure to notice more “visual bread crumbs” instead of gaping at the tile patterns and all the stuff hanging around. 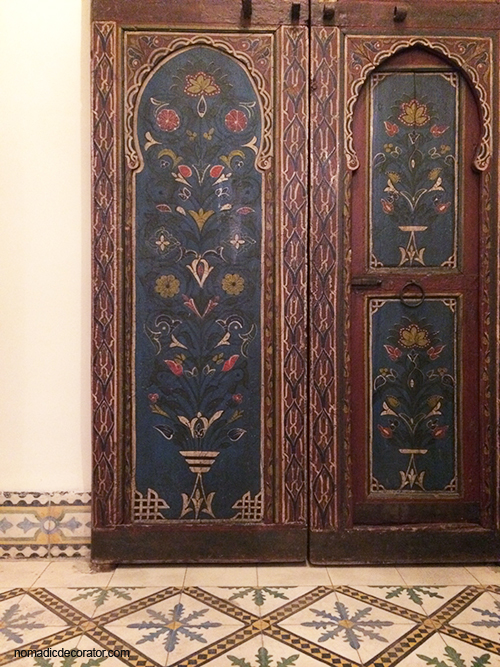 I love this motif at the entrance to Dar Moha restaurant. I want a stencil of this! Do these pics all look fuzzy to you? They look fuzzy to me. For someone who’s so visual, my eyes are really bad! So I’m not sure if they really are blurry or I’m having a bad eye day like some people have bad hair days. 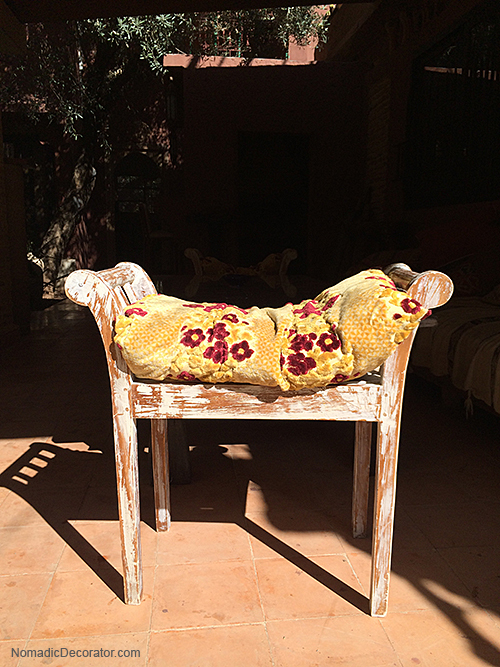 More Marrakech pics and posts coming soon! 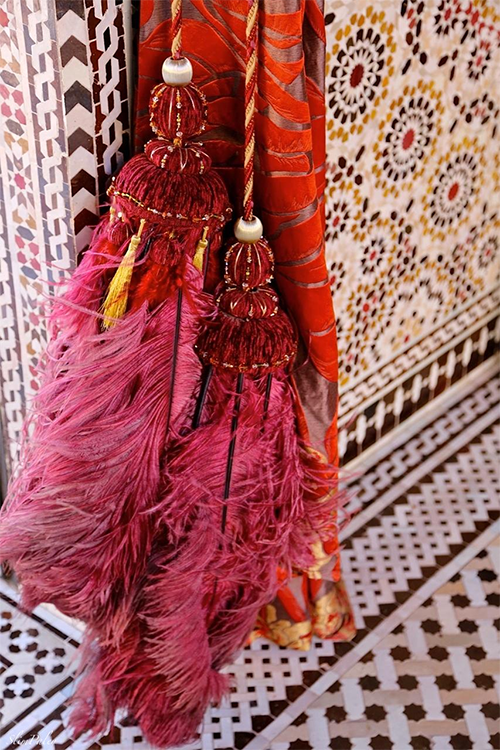 Tomorrow I’m on the way to Marrakech! So excited. 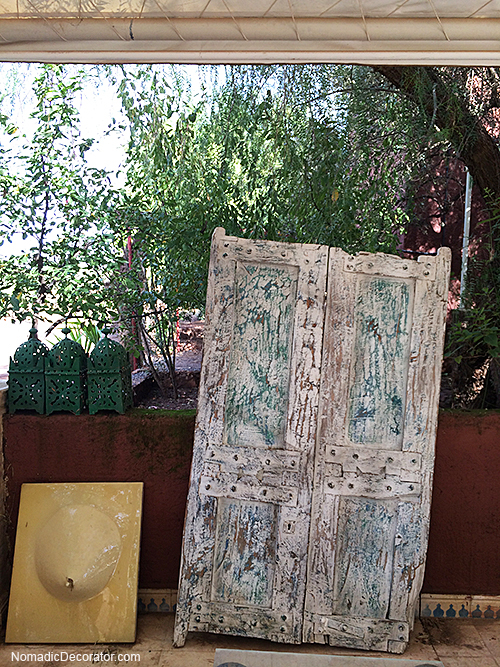 I’m going on Royal Design Studio’s “Paint and Play” Retreat in Morocco. If you like what you see here in the coming weeks, you can go too! 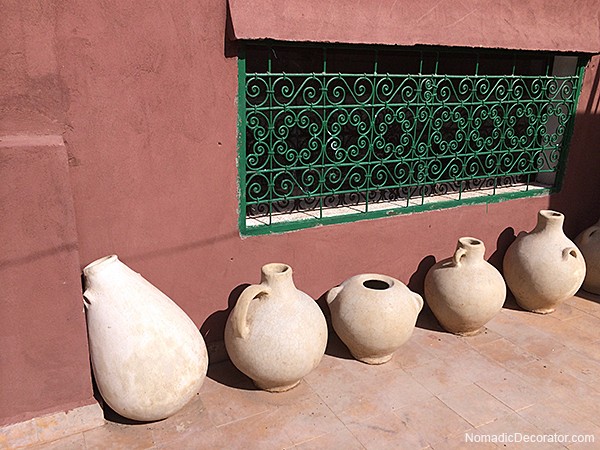 There will be more trips to Morocco in 2015. 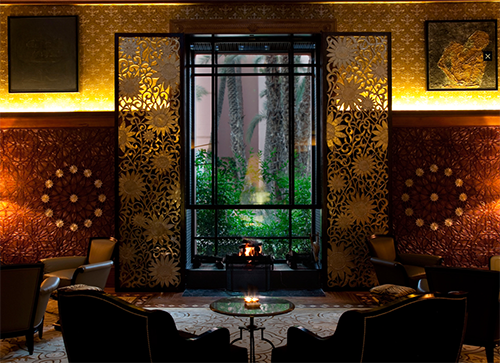 One place we’ll see is the Royal Mansour. Check out these photos and then I’ll tell you more about it, because you shouldn’t have to wade through a bunch of words first. Is this place for real?!? Soon I shall see for myself! I won’t believe it until then. I feel like I need to widen this blog’s image format to 800 pixels wide so you can truly see the details! Like my eyes are straining, I want to see more more more! 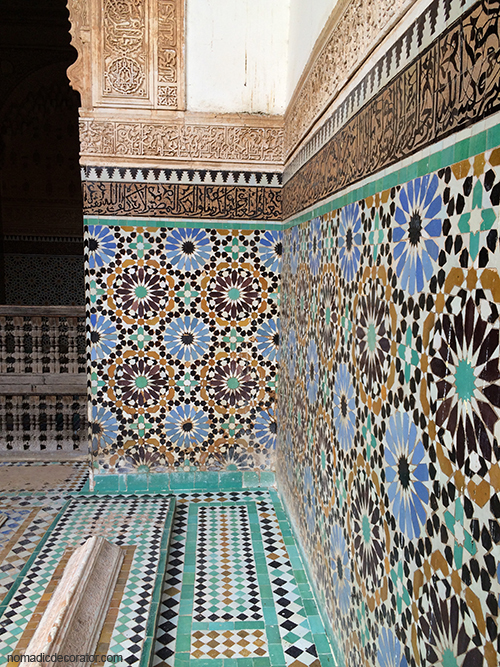 Aren’t the tiles breath-taking. And all the patterns that somehow work together without fighting each other. The strength of the symmetry. 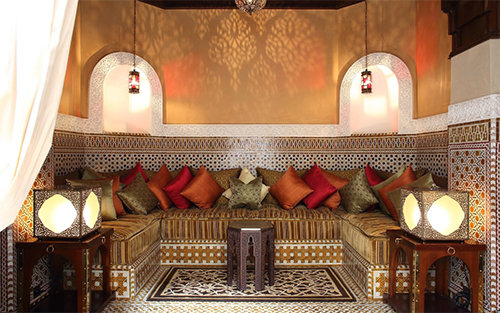 There are over 50 multi-story private riads at the Royal Mansour. Like, entire little homes, not rooms. And all the riads are connected by underground tunnels for service staff. 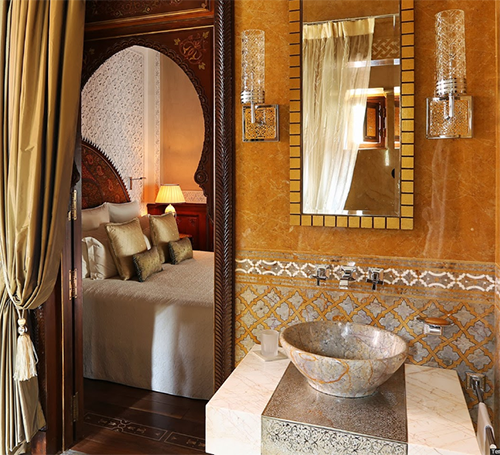 It’s owned by the king of Morocco and was built by his artisans, so if it feels more like a palace than a hotel to you, you may be right. It’s definitely luxury but if you cannot afford to stay there, you can stop by for a drink or meal, or the spa, and enjoy the public areas. See my policies about privacy, cookies and tracking, email lists, affiliate links, ads and sponsored posts.